A mistress in mismatched, catch as catch can, hasty, thrown-together mourning is the shame of any lady’s maid worth the name. This is the cook’s fallen soufflé, the butler’s tarnished silver, the housemaid’s ashy grate played out in the wardrobe. 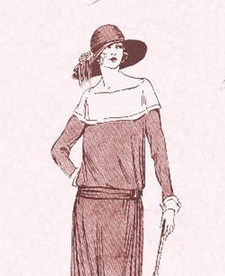 It is imperative therefore whenever travelling away from home to pack one entire outfit of mourning, in current fashion, seasonal weight, and complete with hat, shoes, gloves and stockings. The choosing of this costume is no easy task: it must be neither too ostentatious to mark respect to an mere acquaintance nor too light to serve if a member of the host family should pass away. Plain black cloth with bottle-green or royal purple accents is the canny choice. The fondness of some ladies for the linen frock for daywear in summer, which is sheer perversity given the availability of the wonderful uncrushable, uncreasable Art-linen these days, gives a maid considerable trouble especially when travelling away from home. However, if the garment is folded around a pad for packing, shaken out immediately upon arrival, sprinkled with lavender and hung in a steam room, it can be as dainty and fresh as when it was first ironed. It will, naturally, be creased and limp within minutes of being put on, but there is no remedy for that. Neither a tea gown, nor an afternoon frock, nor a party frock will do for the new habit of cocktail parties. The first is likely to be too sedate, the second too plain a cut and the third too elaborate in decoration or too revealing of the arms, back, and décolletage. 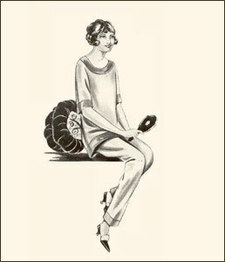 To be under-dressed or over-dressed at a cocktail party will leave a lady open to unfortunate suspicions of being old-fashioned, old-mannered, or simply old and not au fait with this newest and smartest of social occasions. Three cocktail dresses a season, with attendant bangles, chokers, headdresses, light shoes and complementary, toning stockings are the least that a lady requires and any maid with the gumption to lay these in without being told to is a blessing, not a spendthrift. A little bag to match the shoes is a saving in the long run too. Lounging pyjamas are ever so much more soigné than a cocktail dress for any informal evening. They cannot be worn outside — not because they are shocking but because no coat ever looks right with them unless it is long to the ground and then it is too formal for any event where lounging pyjamas might be worn. They should, therefore, be kept for houseparties, but always check with your hostess whether any of the more elderly guests would think them disrespectful. Never wear them in a house of mourning. The new soft “cuff” collars are very fresh and are flattering to a variety of figures. A wide collar such as this can off-set a thick waist, lengthen a short neck, emphasise good collar bones, reduce a full bust, fill out a flat bust, and slim heavy shoulders. It is simply not true that they make a grown woman look like a little boy and no wardrobe can have too many. This season’s Grecian-draped evening dresses are delightful. In shades of oyster, cream, cream-peach, or ivory they are elegant and easy to wear. They are only impractical if the wearer has so little idea of deportment that the drapes become tangled, and so any lady of taste, breeding and refinement need have no care. They do not, no matter what is said to the contrary, look like bandages. A lady's maid or upper servant of any type, being used to dress in black and white when on duty will be keen to ring the changes on her afternoons free. If lilac, pink or sky-blue morning uniforms are worn for everyday then these colours too are best avoided to make a proper holiday of the precious hours. Yellow is cheerful, orange even more so, red is jaunty, grey livened up with a dash of petrol blue, peacock green or royal purple can be most alluring. A maid coming back to the house to take up her evening duties with flattened and messy hair from under a hat brim would not be welcomed by her mistress, and so on afternoons free a hat need not be worn in fine weather, or foul if an umbrella can be found. A ribbon or band in yellow, orange, red, petrol blue, peacock green or royal purple completes the outfit and lets newly-pressed curls or freshly-washed waves show themselves in all their glory. Flat shoes and low heels such as must be worn at work can lead to fallen arches, flat feet and lameness in old age. High heels on afternoons free are of great benefit to the health of the wearer and keep legs trim and shapely. It would be a shame to hide them under long and unbecoming hems. To the argument that long skirts are more respectable than the short pleats of current fashion, I can say that short skirts never get caught in tram wheels, or under table legs when sitting and so are safer and more healthful. Furthermore, if stocking are gartered above the knee then short skirts are neither here not there. On the other hand if the stocking top is hidden when standing and likely to show when sitting, it can have an accidental appearance. A deliberate appearance is always to be preferred and so I would recommend gartering below the hemline and, for modesty, powdering the knees. A servant's life is not an easy one. We can be quite haggard from exhaustion by the time we get an hour to ourselves. In fact, a maid gaily dressed, as recommended, in an orange costume with a newly-washed shingle, high heels and short stockings is in danger of looking wan in the face without a judicious application of some cheerful lipstick and rouge. Tired eyes can need some help to show their beauty too and so a little eye-paint, brow pencil and lash black is strongly advised.